The stunning Mazda ‘Vision Coupe ‘ has won the Most Beautiful Concept Car of the Year at the 33rd Festival Automobile International. The jury, which included automobile and motor sport experts. as well as renowned architects and fashion designers, chose the Vision Coupe, which was unveiled in October in Tokyo over nine other models nominated for the coveted honour this year. They other contenders were: the Audi Aicon, BMW i Vision Dynamics, Kia Proceed Concept, Lamborghini Terzo Millennio, Mercedes-Benz AMG GT Concept, Mercedes-AMG Project One, Vision Mercedes Maybach 6 Cabriolet, Nissan Vmotion and Peugeot Instinct. Mazda captured the same award two years ago for its stunning RX-Vision concept. As the name suggests, the Vision Coupe, like the RX-Vision, embodies Mazda’s next-generation design vision. The proportions of the flowing four-door, with the cabin positioned toward the rear, are characteristic of a classic coupé design, while conveying the powerful forward momentum of a high-performance sports car. 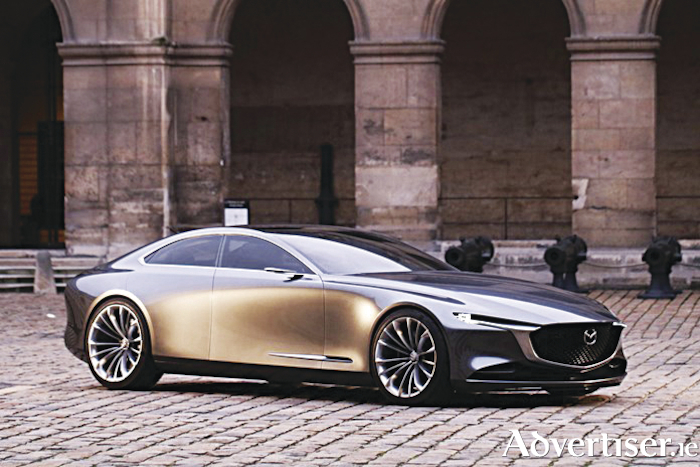 The Vision Coupe was displayed recently in Paris at the Festival Automobile International’s concept car exhibition. The annual festival attracts some 35,000 visitors.